Below is a letter explaining Chucky’s Fight and our Mission. If you are interested in having us speak at your school, event, or group, please give me a call or send me an email. 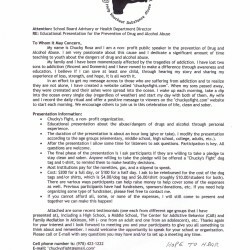 Cell phone: (978) 423-1222 Email: chuckysfight@gmail.com Below are the testimonials mentioned in the letter.